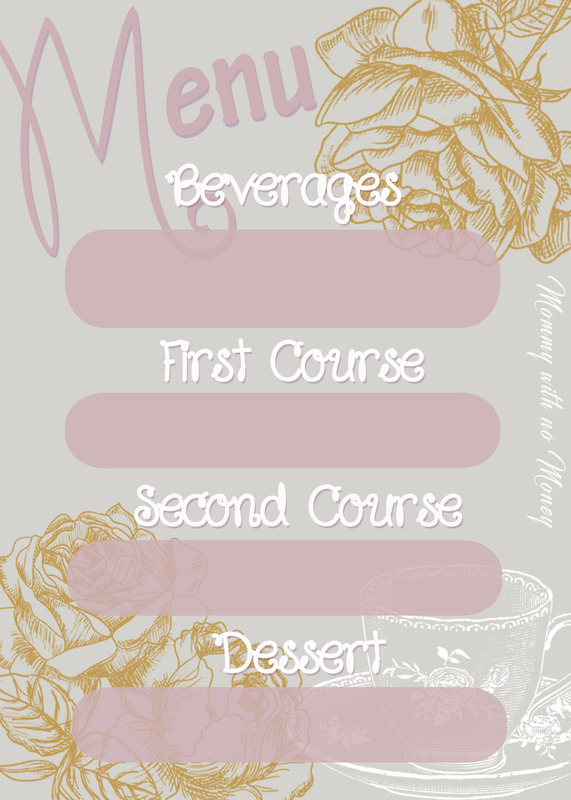 Invitations for this party are key…the princess would never send out email invites, you must make fancy invitations to send out to all your guests! YOU MUST. I found this idea on Pinterest and thought they were so freakin’ adorable, so I had to create them. 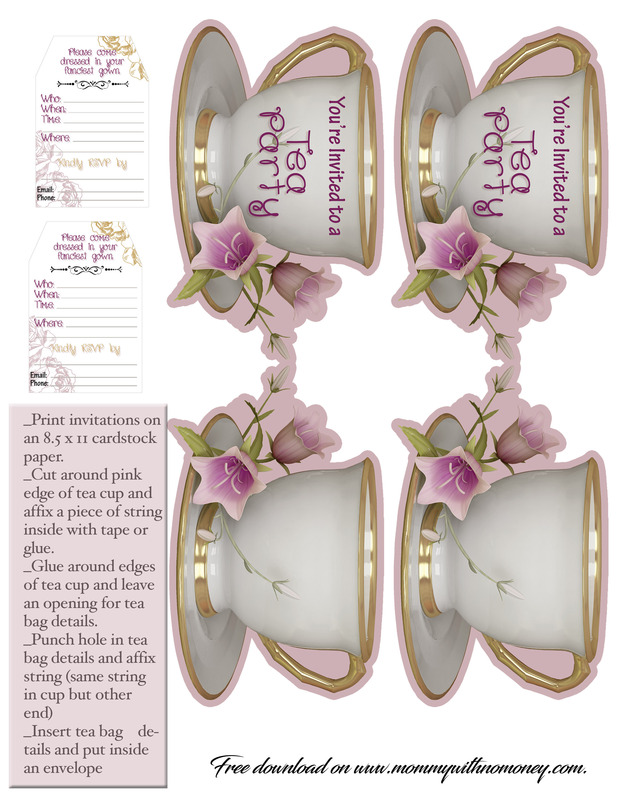 If you like this idea, here is a blank version of the tea cup invitation here. I attached the tea bag inside with tape and a piece of string. Make sure to attach it inside very securely, since this is the actual invite and you don’t want any kids to loose the party details. To make the envelopes less boring, trace a doily pattern onto the corners (I used a a gold sharpie). The invitations say to wear “your fanciest gown” and we put this instead of sundress because it gives the girls a chance to feel like a princess in their elaborate clothing. Seriously, when are they ever going to get a chance to dress up in fancy clothes? The obvious decor choice is tea cups…lots and lots of teacups. I had none, so I went to Value Village and bought them out of tea cups ($80 worth). I purchased one for each girl (all unmatching, but that’s what gave the theme character). I also picked up some lace table cloths, fake pearls, vintage style napkins (all found at value village) and added some greenery from dollarama). I used a few things I had around my house, mostly any bird ornaments I incorporated into the decor. Flowers, picture frames…really anything that looked pretty, I tried to use. Tea – I made iced tea for the girls, since I didn’t think they’d care too much for hot, herbal tea. We poured it into tea cups and I told all the girls to put their pinkies up, because obviously this is how they do it in London, duh. We just used your standard Good Host Iced Tea, Lipton’s Mango Peach Tea and a Raspberry Iced Tea I picked up from the grocery store. I am sure you could be really eager and brew some tasty fruit tea yourself, but ……. I was lazy. Cookies & Treats – Check out my recipe for “Quick and Easy Shortbread Cookies” to make some cute heart or flower cookies. My mom also made some meringue cookies which were dee-lish. I made a cute, two tiered serving tray out of plates and tea cups from Value Village. I flipped a tea cup upside down and glued it onto the bottom plate and then the other cup, right side up, to the top plate which was used to hold napkins or cutlery. Cute right?! There were no crumpets (because I don’t really know what those are), but we had wee sandwiches, cheese, crackers, gherkins, fruit cups, veggie cups and biscuits. 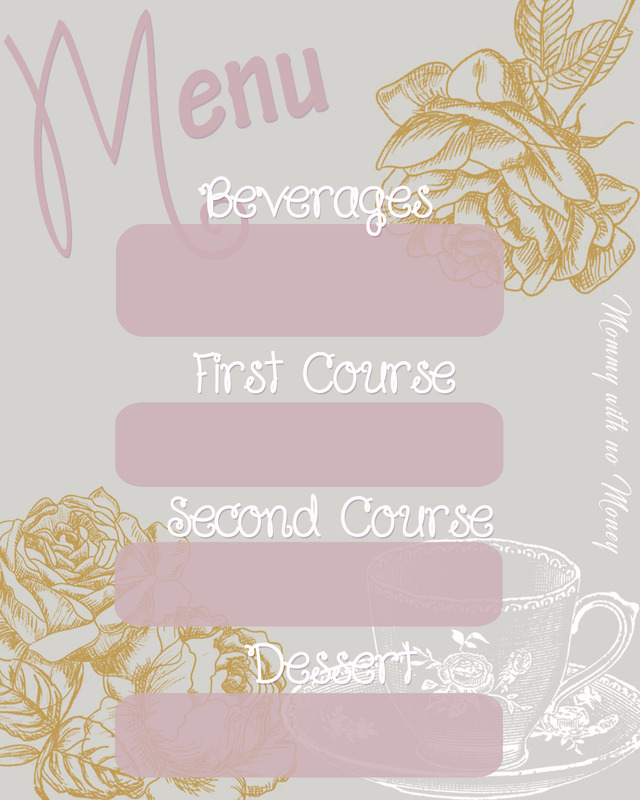 I made a little menu plan that I framed and added to the buffet. You can print the 5×7 version HERE or the 8×10 version HERE. Flower Headbands – You’ll need to purchase or make flowers (lots of them). I made a few detailed ones out of fabric, jewels, and lace. I made about two for each girl (since they are very time consuming). I had a few flowers left over from my wedding bouquets, so I used them and made a few more. I will hopefully have a tutorial up soon on how to make these, but you can find many tutorials on Pinterest. You’ll also need a variety of feathers, lace pieces (I had leftover’s from my wedding dress), butterflies, dragonflies, ribbons, tulle and anything else you think will look cute on a headband. Obviously you’ll need to buy plain headbands (I found white) and some felt (I went with beige). You’ll need to cut out two sizes of circles in the felt (one small, one a little bigger). Glue the bigger felt piece onto the bottom of the headband and the smaller one on top (to the larger one). Glue it off to the side, since this looks more royal. Put everything onto a table and have the girls make their own creative headband with hot glue. Here is what mine looked like…. Yes….. I had to make one for myself! And here is what Anna’s looked like with no help from me… cute right?! Photo Shoot – What will make you feel more like a Royal Princess than Paparazzi?! I bought some fabric from Dollarama and sewed the pieces together to create a little backdrop (it wasn’t wide enough, but it worked). I borrowed a funky chair from work and picked up some cheap props from Dollarama (hats, feather boas, flowers). I got the girls to pose together for a fun photo shoot. If a backdrop and/or props are not in your budget, just get the kids to pose fancy and take some pictures anyways. Find a plain wall or go outside in the garden and shoot away. They will have so much fun. And there you have it, a Royal Tea Party Birthday. Cheerio!